New BEMANI rhythm game location testing right now. Another arcade game? Wonder what this'll be. The end of REFLEC BEAT looms closer. These are what Nostalgia did to BeatStream cabs. The inevitable conversion of RB cabs. 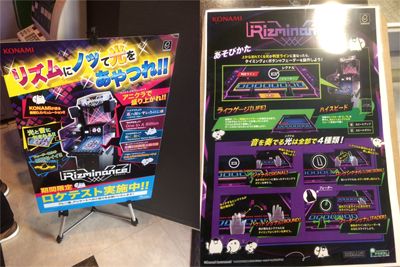 And looks like Konami’s take on Sega’s Chunithm franchise. I'm a little woried that Konami is speading themselves too thin with so many rhythm game franchises. It's only been six months since the launch of Dancerush. I'll be interested in seeing how this turns out though. You know, I wouldn't be surprised if R1 gets this game, and it would be the closest we'd get to getting Chunithm in the US, from the looks of those pics. Understandable but as we’ve seen with MUSECA, BeatStream, and now RB, they can repurpose the machines on to something else so they’re recycling them on to new games. Jesus, another new BEMANI game? Slow down guys, Nostalgia and DanceRush were enough! Konami wants that CHUNITHM money. It all depends on the licensing. "wae u can't be BeST"
-To save costs, the monitors on the arcade cabinets are replaced with red and black DMD displays found on most pinball machines since 1991. Veterans are furious, but pinball nostalgists rejoice. There's no sense in pointing out the obvious, Kiernan. Those are some fighting words, RYAN. Back on topic: if this ends up coming to Round One I'll probably end up trying it. I have my doubts about the Round 1 treatment, since Reflec Beat wasn't an option to play at western locations. It would be odd for the chain and Konami to provide them for us.